Tome un paseo por Fresh Pond Reservoir, de ejercicio de Danehy Park, ir de compras en Whole Foods y Trader Joe. A una milla y media de Harvard con una plaza de aparcamiento privado, este apartamento es una base perfecta para su visita a corto plazo. Este apartamento tiene capacidad para seis y es ideal para una familia o grupo que busca una estancia prolongada de alta calidad. Simplemente con todo elegantemente amueblada de dos dormitorios con dos baños completos (baño principal tiene una gran ducha, otro baño tiene una bañera y lavadora / secadora). Pull-out sofá-cama de matrimonio. cocina totalmente equipada para cocinar. Se proporciona un suministro inicial de detergente, jabón, champú, etc.. Porta cunas pueden estar disponibles a petición. The condo was in the best location and completely met our needs. Super friendly owners too. Definitely will stay here again. This apartment did not disappoint! The pictures are completely accurate and it really DOES look that good. I am pretty particular about cleanliness, and this apartment was as clean as my own home. If you need something, most likely it will already be at the apartment. From Static Guard to lint brushes, this place had it all. I did not cook while I was there, but if I wanted to whip up a 5-course meal, everything I needed was there (except the food -- that you have to supply yourself). The bed was comfortable, the apartment complex was quiet and parking was easy (I had a covered parking spot). I had a car, but you probably wouldn't need one as there is a Trader Joe's and Whole Foods a block away. The owners were very responsive and answered questions in a timely manner. I would rent this place again, HANDS-DOWN. If I could give the rental more than five stars, I would. I do not have one complaint or suggestion on what could be better. We had everything we needed in this wonderfully located apartment. 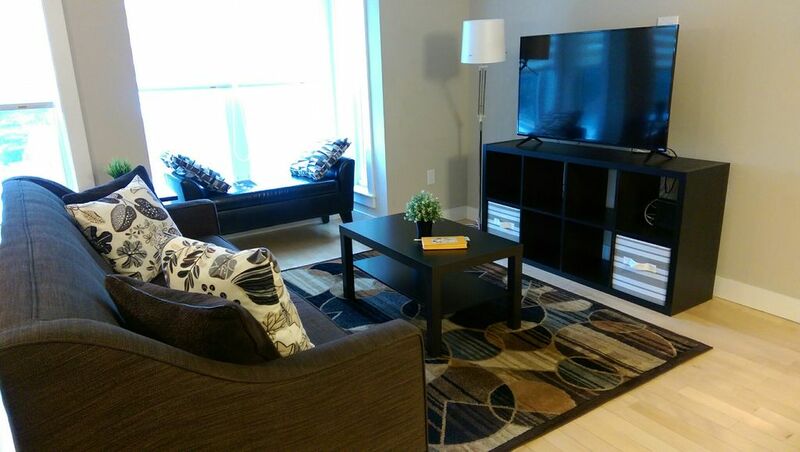 We enjoyed easy access to Fresh Pond (great for morning walks), shopping, groceries, Cambridge and more. The living/dining/kitchen area was a great place for our family to congregate during our holiday. The reserved parking space was so appreciated! Recommend! Contact us about special discounts for stays longer than 30 days.